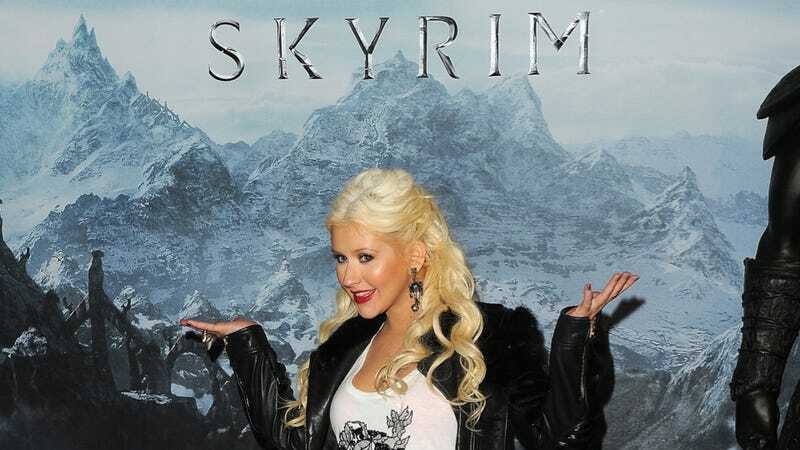 Last night in Los Angeles, Bethesda threw a superstar shindig for its superstar game—The Elder Scrolls V: Skyrim. In attendance were an array of celebs: Lynda Carter of Wonder Woman fame, Tiffani Thiessen, David Arquette, and Christina Aguilera as well as famous people I've never heard of. Xbox 360 demo kiosks were on hand at the Belasco Theatre, where Perry Farrell and Dave Navarro of Jane's Addiction also performed. The gallery above provides a rundown of the evening, from the red carpet to the Belasco stage, and (almost) everything in between. Never mind how how many of these folks have actually heard of The Elder Scrolls before last night, that's not the point. This is Hollywood, and that is the point.